Montreal: CLAC organized its annual May Day demonstration on the theme of the G7 this year. The planet’s most powerful will gather June 8th and 9th for a major meeting in the Charlevoix region. This year, May Day saw the unions agreeing to accommodate the bosses’ calendar by holding a march Saturday April 28th, gathering several thousand people. 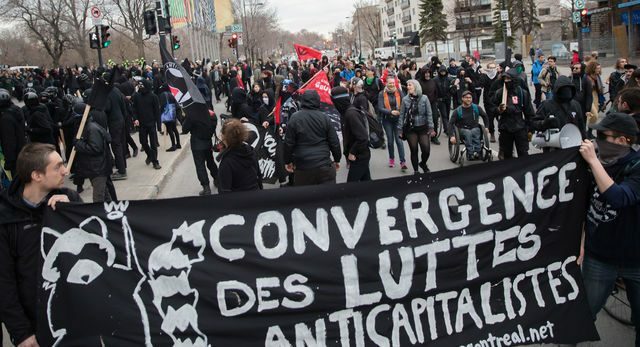 On the first of May, three demonstrations were called in Montreal: CLAC’s at Parc Lafontaine, the Revolutionary Communist Party’s in the Golden Square Mile, and the IWW’s in Parc-Extension. About 200 people gathered towards 6pm at the southwest corner of Parc Lafontaine for the CLAC demo. Lots of police were deployed all around with bike cops as well as numerous buses of riot police. The SPVM had made up its mind to let no one demonstrate on this May Day. The crowd growing gradually, one noticed the presence of about forty individuals putting on black clothing, looking to form a black bloc more consequential than in recent demos in Montreal. The riot cops chose to move in closer to leave the small crowd no room to maneuver. Just before the departure, some speeches were given on the ravages of capitalism locally and elsewhere. The demo then took the street towards 6:30pm on Sherbrooke, going west. The cops then decided to take the sidewalk on the north side to begin forming a kind of moving kettle around the demo. A small but very determined black bloc did not want to allow them this space prized by the Urban Brigade which gains considerable tactical advantage from it. By taking the sidewalk, the Urban Brigade is able to control the whole of the demo, in that it can decide where to direct the crowd. This greatly limits attacks on symbols of capitalism, such as banks. Taking the sidewalk should be a collective reflex of the demo, because having a demo encircled by the SPVM is a problem for everyone. If removing the cops from the sides remains the work of a small part of the demonstration, it will remain very difficult to hold the street in Montreal in a more combative way. Protected by banners the black bloc decided to empty a fire extinguisher, throw bricks and rocks, and shoot fireworks at the cops, to force them to make a retreat. While the cops backed up a bit, a number of them choosing to hide behind parked cars in fear, the strategy was not as effective as hoped, as the demo found itself split in two with the arrival of a second Urban Brigade on the other side, which pushed the rear of the demo back east and made one arrest. At this moment the police rapidly regained control of the situation, deploying riot cops on the streets north and south of Sherbrooke. People had no choice but to disperse or return to Parc Lafontaine just five minutes after the start. It wasn’t the clash with the cops that forced the dispersal, but rather the arrival of cops from all sides in large numbers. The dispersal was also facilitated by the lack of closer links between people in the demo. Being able to keep a much more compact unity could have limited the damage caused by the cops’ intervention. Keeping a slower pace and ensuring that no one is isolated at the front or the back could have possibly allowed the demo to go on for longer. The cops prepare for annual demos like May Day months in advance, and they seek to disperse us as quickly as possible. Finding ways to unite the intentions of every person who shows up is difficult, but it remains the key to continuing to hold the street. This is a text that calls for others: how did you experience this May Day, and what could be done so that we continue to find each other in the street?